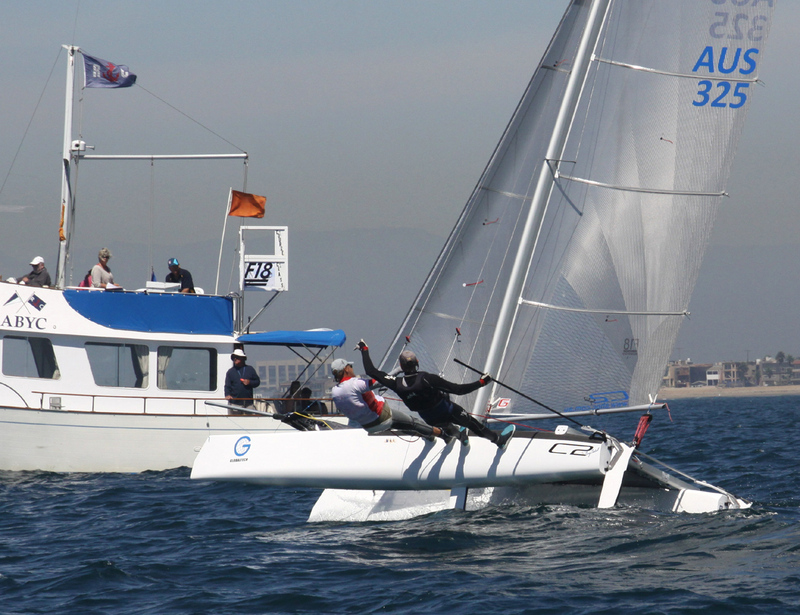 A heatwave and high pressure system over Southern California delivered very light conditions to Long Beach for the final day of the 2012 Globaltech F18 World Championship. 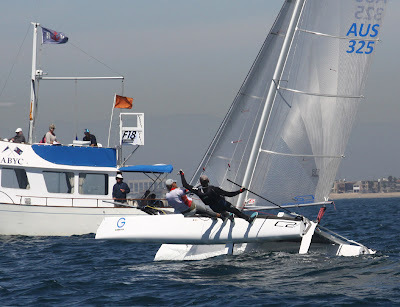 Easy Tiger Racing's Chris Way and Rod Waterhouse paid a heavy price for misjudging the start in the eight knot south westerly breeze for the one and only race that the Race Committee managed to get away in the Gold Fleet today. "That mistake really hurt us and we ended up finishing 38th and that was it. Because we were able to discard that result we have finished the regatta in 29th place overall," Chris Way said while de-rigging the boat. "If you look at the results a lot of the top guys got caught out today. Mischa Heemskerk scored a 27th and Bundy (Darren Bundock) got a 28th. The wind phased left and all of us at the committee boat end of the line got caught out. 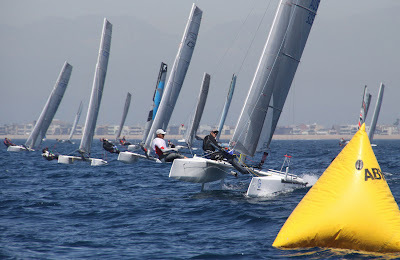 The wind was still moving around at the start so it was a bit of a crap shoot," he added. 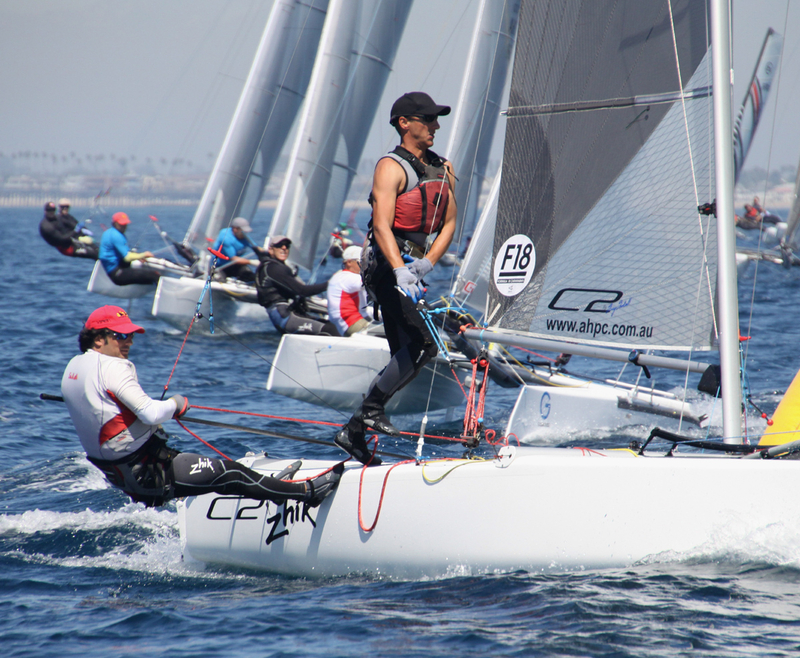 "We're pretty happy to end up in 29th overall and second in the Masters. We were never going to catch Robbie Daniel who won the Masters and placed 17th overall. We did our very Tiger best and hey we won a heat. “We are stoked to be second in the Masters among 50 entries. It’s a great outcome and also to finish in the top quarter of the fleet overall. Our boat speed improved throughout the week and we got better every day except for today," Way said of his team's performance during the regatta. "Clearly the young guns aren't getting better if a couple of oldies in their fifties can win a heat. So next year in Tuscany we will get serious and give them a true Tiger licking," said Skipper, Rod Waterhouse, with tongue firmly planted in cheek.